Braun, Lilian Jackson. 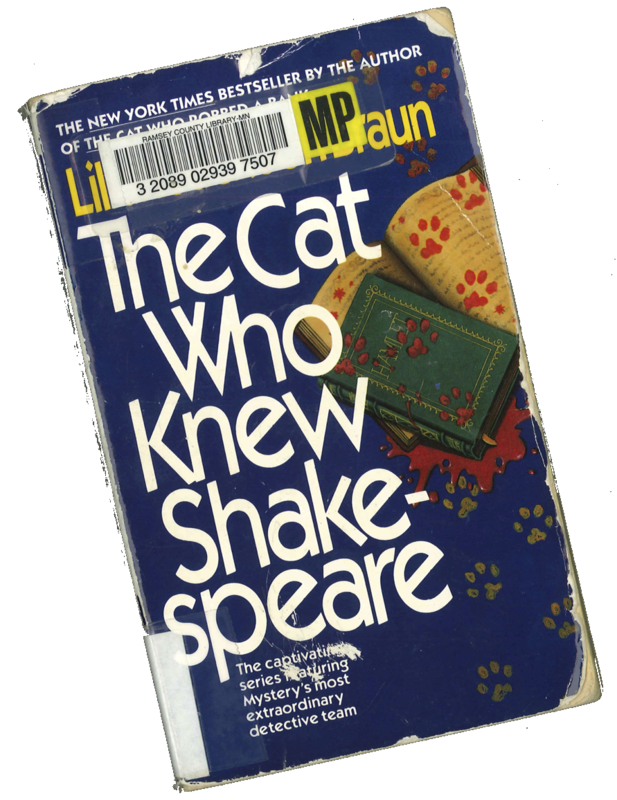 The Cat Who Knew Shakespeare. New York: Jove books, 1995. Speaking of mysteries mit Shakespeare, I recently read The Cat Who Knew Shakespeare. After all, summer can't all be re-reading the plays and critical articles on the plays, can it? This is a much lighter read than the Shakespeare and Smythe series (i.e., it's not as good and it lacks depth), but it was at least mildly interesting. The Shakespeare comes in as a trope throughout the novel. The main character is a private detective in a very small town. He has two Siamese cats: Koko and Yum-Yum. 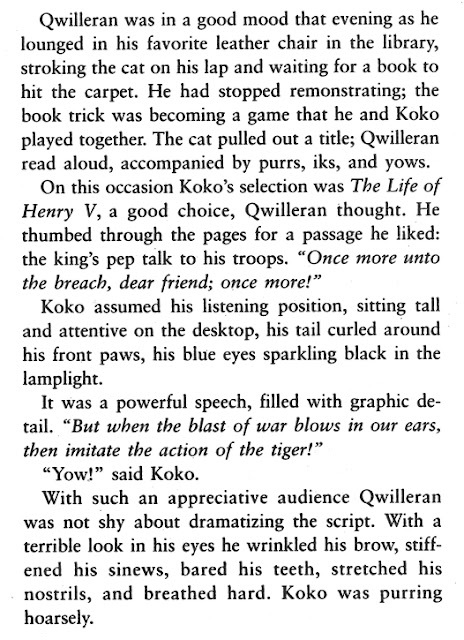 In this novel, Koko becomes enamored of a set of Shakespeare plays. He pulls these down at opportune moments throughout the novel to illustrate or to foreshadow plot points. For example, he pulls The Tempest off the shelf and onto the floor right before a blizzard (which is a sort of a tempest, I suppose). The novel occasionally exploits the ambiguities in the plays Koko decides to toss on the floor—and I wish it did so more or in more interesting ways. What could producing the Hamlet volume mean? A thousand possibilities open before us—but the novel often has our main character pinpoint the precise intended meaning. 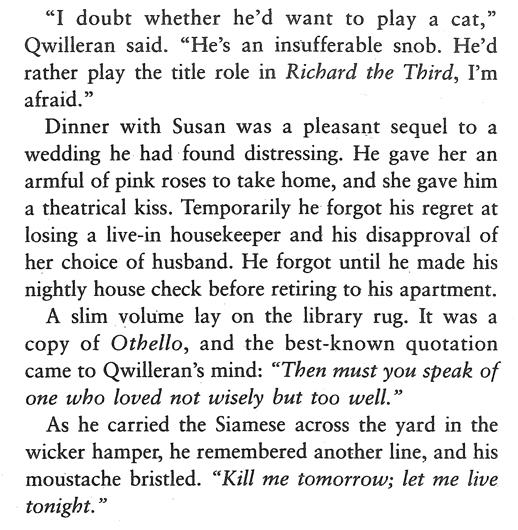 Perhaps that means Qwilleran would make a good Shakespeare scholar. I'm providing two separate examples to give you a sense of how the book works—it's up to you to determine if this light read will lighten your days. Koko is probably imagining himself as a tiger's heart wrapped in a cat's hide. Here, there is some ambiguity over the reason this play was left on the floor.